With the holidays right around the corner, you might be looking form a game to play with the family. Something easy to teach, quick to play, supports half-a-dozen people or so. Something casual, that allows you to socialize while participating. Thanks to the recent popularity of board game cafes like Across The Board, I've had a chance to try out a couple games that fit that very definition. There's times you where the game is the centre of attention, where that's what you're all there to do. But more often than not, its just the excuse for you to hang out and catch up with a circle of friends and family. I've found the following games work perfectly for this; they're quick and they're fun, enough so that I've eventually added a couple to my own collection. Maybe you'll do that same. 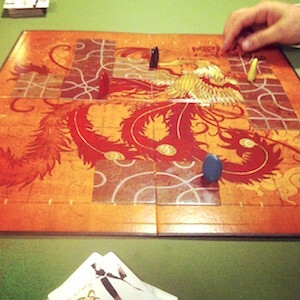 Tsuro is a tile game designed by Tom McMurchie. You are playing oriental dragons riding the twirling, twisting winds and airs. Your goal is to use tiles to build a continuous linear path that your dragon piece can follow without that path leading off the board or it leading to a collision with another player. The rules can be taught in a minute or two, the game can be played in five to ten minutes, the components are all solid and of high quality, and the theme comes out extremely well despite the overall simplicity. The box says the game can be played with two to eight people, but I find it works best with around four to six. At that point, you've got enough people on the board to have to plan around without having so many people that it becomes more of a matter of chaos and luck. If you're interested in seeing how this game is played, you can watch Wil Wheaton demonstrate it online on an episode of Tabletop. 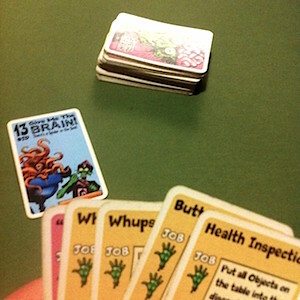 Give Me The Brain is a fast paced card game designed by James Ernest. In it, you play as zombies forced to work in a fast-food restaurant, trying to get all their jobs done... but work keeps piling up, and the hapless zombies only have a single brain to share amongst themselves. 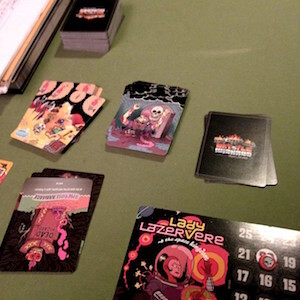 Its a card game where the goal is to completely get rid of all the cards in your hand. But many actions require use of a six-sided die, of which there is only one, and it gets passed around the table often. The art is bold and fun, the text and theme is hilarious, the game plays fast, and there's enough thought put into the mechanics for you to be able to play strategically despite the randomness of the draw. If three or four of you are looking to fill ten minutes, this is a great game to play. And once you're done, it packs up small. Great little package, if you can find a copy. Bang! The Dice Game is designed by Michael Palm and Lukas Zach. They've done a great job of keeping all the fun, thematic elements of the original card game while stripping out some of the pieces that could sometimes slow it down. 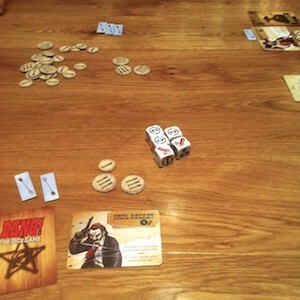 This game is every spaghetti western you've ever watched, with everyone looking to out-draw everyone else at the table. You all get a role to play (sheriff, deputy, outlaw, or renegade), but those roles are kept a secret, and your overall goal is dependant on sussing out who's who before you get gunned down. You roll dice to collect sets of symbols, all while dodging gunfire, drinking at saloons, and avoiding indian raids. Though I own and enjoy the card game, I find it can drag out a bit, especially if you add in some expansions. A slow paced and/or long running game can be frustrating if you've been eliminated early and have to wait for everyone else to finish. The dice game doesn't have the same strategic depth of the card game, and it still manages the same player elimination rules... but it moves fast enough that its less of an issue. With easier mechanics and a quicker pace, I find this version works much better as a casual game. Epic Spell Wars is designed by Rob Heinsoo and Cory Jones. Its the most recent game I've bought, and so far, it's been one of my favourites. You all play wizards having righteous magic battles to determine who is the most awesome amongst you. Rock on! Gameplay involves creating spells by mixing and matching three different types of cards. The text on the card determines the effects, the damage, and the targets. The look and humour really shine in this mechanic, as you combine pieces of names and artwork into hilarious combinations. And though there is player elimination (like in Bang, above), the eliminated players earn extra cards each round the game continues. This effectively gives them an advantage for the next round fo play proportional to how early they got knocked out. The humour is great, the art by Nick Edwards is amazing, and the gameplay is flexible and fast. There's too much luck to be to play tactically, but that works in its advantage here. The only downside is the rulebook has some swear words in the introduction; had they cut those out, I could recommend this game for any age group.